Members of Dance Heginbotham performing “Chalk and Soot” while music is played live (and mostly onstage). BECKET — Last year, celebrating the centennial of the legendary premiere of the Igor Stravinsky/Vaslav Nijinsky “Le Sacre du Printemps,” it seemed everyone in the dance world was trotting out a version of the ballet. Though half of choreographer John Heginbotham and composer Colin Jacobsen’s “Chalk and Soot” was commissioned as part of Carolina Performing Arts’ “Rite” fest, the two took a different path down memory lane, following not Stravinsky and Nijinsky, but the poetry of the painter Wassily Kandinsky, whose book of woodcuts and poems, “Sounds,” was published around the time “Sacre” debuted. While “Sounds” doesn’t have the scandalous glamour of “Sacre” (the ballet’s opening night is infamous for the near-riot that broke out amongst audience members), it also influenced other artists at the time and is still a marvel of invention. 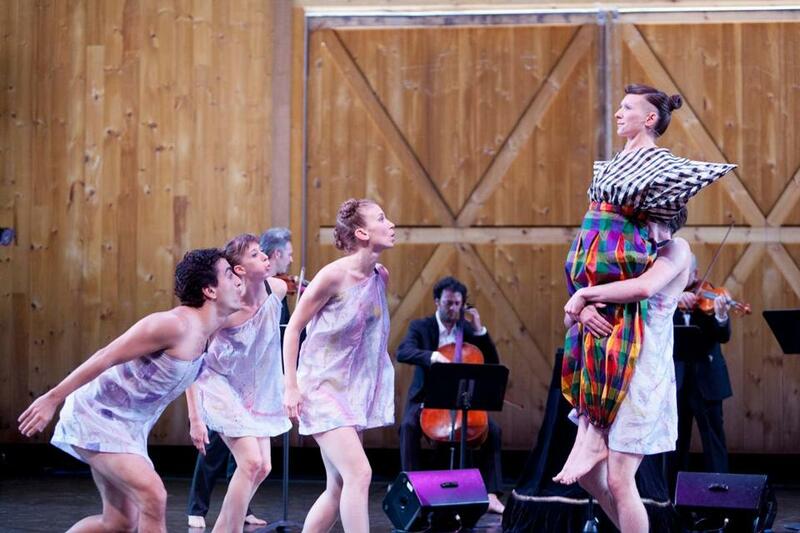 In the world premiere this week at Jacob’s Pillow of the now evening-length “Chalk and Soot,” Heginbotham and Jacobsen demonstrate that they were more than just inspired by “Sounds;” they have matched its palette with fine ears and eyes, maintaining a keen balance on a line between whimsy and melancholy. The piece is smart, wicked, and fun, and extremely generous of heart, even at its goofiest. The dance is performed by five members of Dance Heginbotham, while the music is played live (and mostly onstage) by Jacobsen, fellow members of the string quartet Brooklyn Rider, and vocalists Shara Worden and Gabriel Kahane (who also plays a reed organ). The work’s striking theatricality puts it firmly into the dance theater genre. The two main collaborators are supported by Nicole Pearce’s canny lighting, which is dramatic and stark in the first part, sparer and brighter in the second, and by Maile Okamura’s costumes, whose simple geometric designs for the dancers, if a tad humdrum, faintly conjure the black-and-white Kandinsky woodcuts. The string players are monk-like in their handsome long charcoal robes, while Worden looks as if she’d wandered in from a production of “The Magic Flute,” her arms hidden most of the time in a strange black-and-white checked top, like an avian-human experiment gone awry. It’s a flight of fancy that pays off, complementing Worden’s fey, almost disturbing presence. She is both observer and center of this universe, and she’s thrilling. Heginbotham’s musicality invites comparisons to that of Mark Morris, in whose company Heginbotham danced for years; much of the movement vocabulary and staging, however, suggests that the spirit of Merce Cunningham also flows through his choreographic veins. The dancers perch on one leg (now academic, now with a flourish of creaturely exoticism), tilt into cantilevered piqués, or burst into drily energetic bouts of allegro. This ensemble is strong and likely to be ready for more as the company goes forward. Occasionally the movement mimes the text, but Heginbotham is wisely sparing with overt illustration, so its presence is charming rather than pedantic. Conversely, when one of the dancer’s gestures suggest that she slices a wrist, then wipes that wrist across her forehead, the moment is evocatively weighted, as if we’re wading through a fragile memory. The confidence of this piece suggests the model — collaborative work with a dramatic inclination — is one in which Heginbotham has something to say. The straight-ahead dances he presented in his Pillow debut two years ago began with vigor but stalled fussily after a while, lacking direction. “Chalk” looks promisingly fresh. This year’s recipient of the Jacob’s Pillow Dance Award (at $25,000, a sizable honor), Heginbotham has only recently retired from full-time dancing. While there is trial and error ahead in his newer role as director/choreographer, it could be that he has a deep well to draw from.